One is barely aware of crossing over Chiswick Bridge while driving on busy A316. However, approaching the bridge along the River Thames is a much more pleasant experience. I was surprised by the number of rowers along this stretch of the river. We passed several pubs that boasted of their rowing teams, which must be a British institution. The Chiswick Bridge is just a bend in the river (about a mile) downstream from Kew Bridge. The total length is 185 m and comprises five reinforced concrete arch spans clad in Portland limestone. It was designed by Alfred Dryland and built in 1933 by Sir Herbert Baker. It was dedicated by the Prince of Wales (who later became the Duke of Windsor after abdicating the throne). We can see that 20th century arch bridges across the Thames (strengthened with reinforced concrete) have shallower and longer spans. 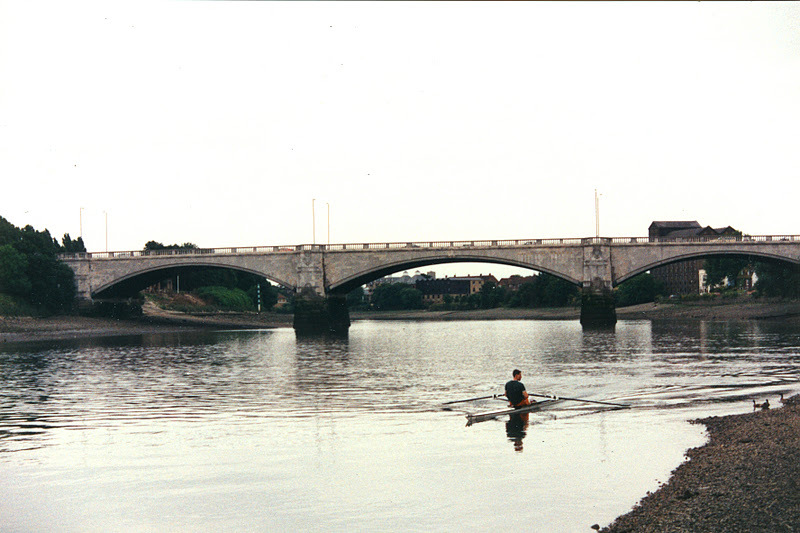 However, the use of stone cladding and ornamentation makes the Chiswick and Kew Bridges look like older bridges. Maybe it's because arch bridges have been used for so many centuries that we expect them to reflect an older architectural style. Thames River Bridges: Chiswick Bridge by Mark Yashinsky is licensed under a Creative Commons Attribution-NonCommercial-ShareAlike 3.0 United States License.